This past Friday, school public relations professionals from across North Carolina convened in Greensboro for the annual NCSPRA Blue Ribbon Awards for Effective Communications ceremony. 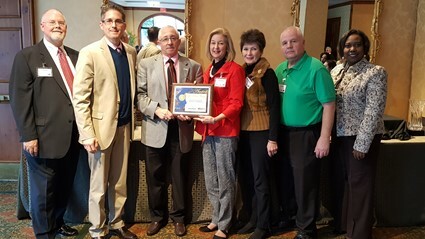 WCPS was one of 31 districts across the state to receive a NCSPRA award. Through its partnership with WCPS, CSS of Wayne County has eight “Success Coaches” who provide one-on-one support to elementary, middle and high school students “at risk” of dropping out of school. In addition to the Success Coach program, CSS of Wayne operates three community-based programs including the Teen Court, a Mediation program and a Community Service program. All of the programs focus on helping WCPS students stay in school and to successfully graduate.